In 1998, the Illinois Department of Transportation Division of Aeronautics conducted an Economic Impact study of airports in Illinois. The purpose of the study was to provide valuable information for planning purposes and to help educate the public about the importance of airports in regional economics. According to this study, the Macomb Airport generated a total local economic impact of $2,591,850 per year that included 8 full time jobs and 5 part time jobs. This included economic activities such as local taxes, payroll, and all local operating and capital expenditures made by the airport and related airport businesses. It also included economic activities associated with users of the airport services and the cycling of dollars through the local economy. The Macomb Airport Authority is the governing commission for the Macomb Airport. Of the five member board of commissioners, three are appointed by the Mayor of Macomb and reside within the city, and two are appointed by the Chairman of the County Board and reside within the taxing district that consists of the City of Macomb and 20 sections of Macomb Township. The Macomb Airport Authority was established in November 1964 by referendum. Construction began in 1967 and was dedicated on July 20 1969. The airport's initial improvements were a 3300 ft. x 60 ft. hard surface runway, one T-hangar and office space, taxiway, apron, and lighting. The usage and growth of the airport has changed drastically since that time. 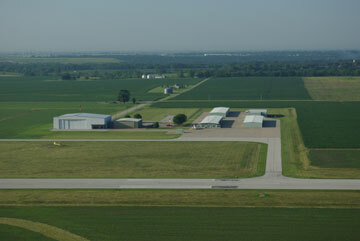 The airport sits on 380 acres of which 250 acres is farmed and 130 acres for airport use. Annual events include an open house/fly-in and breakfast during the community Heritage Days celebration on the last weekend in June. In 1996, 2008, and again in 2017, the Illinois Department of Transportation's Division of Aeronautics recognized the Macomb Airport as General Aviation Publicly Owned Airport of the Year. This award is given for outstanding work in the areas of airport maintenance and appearance, community support, and promotion of aviation. Site Design by Infobahn Outfitters, Inc.